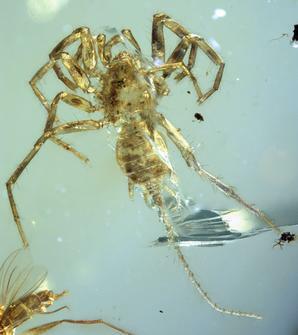 If you haven’t heard about the exciting discovery of a “spider-like” ancient creature from 100 million years ago, now is the time to check it out! Named Chimerarachne yingi, this little beauty has eight legs and a tail, and is exquisitely preserved. I only wish H. R. Giger had been around to see it. You can read more about the discovery here. It’s day three of Operation Move Sue the T. rex over at the Field Museum. To follow this story, follow #SueOnTheMove. The big item on everyone’s calendar is of course the NatSCA Conference 2018 – this year hosted in Leeds. Keep the dates 26th and 27th April free. I’m hoping people bring their live-tweeting A-game this year because I’m not able to go, so I need to live vicariously through you wonderful people. You can find more information on our website. Paper and poster submissions are now closed but you can still contribute; continue reading to the next section for more information. Also on in April: the International Symposium on Climate Change And Museums. You can find information on speakers here. This runs from the 11th to the 13th April in Manchester, so plenty of time to recuperate before #NatSCA. – How has this helped or impacted your work? – Have you had any exciting things happen because of your social media interactions? – Have you had any unusual partnerships happen? If you can help, please direct feedback to Jan (jan.freedman@plymouth.gov.uk). Thanks in advance! Mark Witton has been picking at the faces of tyrannosaurs recently – a critical assessment of the claims made by Carr et al. 2017 regarding osteological correlates of facial tissues. Well worth a read, as is the paper, it refers to.